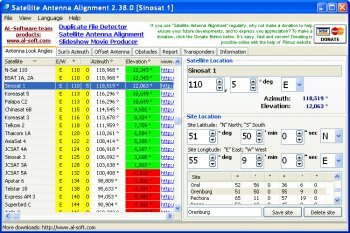 Satellite Antenna Alignment is used to calculate the angles necessary for installing satellite dishes. The main difference from similar software is the possibility to calculate the position for all satellites at once. Thus, you get a clear picture about what satellites can be physically visible from the location where the dish will be installed. Additionally, the program has a mechanism for calculating the azimuth of the sun and you can do everything without a compass now. 'ReleventKnowledge is anything but benign & classified as Spy-ware by some company's. I wouldn't have 'RelevantKnowledge' on any PC I use. I reported this program (the link is one of the 3 below the download now). And I'm adding it to my permanent ignore list. There are quite a few different programs out there that do the same exact thing as this one. It does what it says, and does it well...lots of functionality and even a couple small things the others don't offer. With so many of these out there, you've got to find a niche to corner...I'd say it's all about GUI. All of the satellite finders out there have very simplistic GUIs - including yours. People want 'eye candy' these days...everything with rounded edges and pretty colors. If you can utilize the same great functionality you already have along with a nice GUI - you've got a winner. One thing that really bothers me though, and hence the 3 star rating: The register nag window is completely unnecessary for a free product. I realize you may have to advertise cheaply, but this isn't the answer - include in bold the commercial license agreement in the EULA, perhaps with a register/donate button there, but not a nag screen - NO ONE wants to close a nag screen to use a program. Other than the above mentioned, this program is right on track. Keep up the good work, and look into cornering the market with a nice GUI! !